Paulo Coelho wrote- “No one loses anyone, because no one owns anyone. These words stuck a chord with me and I pondered the depth and scope of what it means to lose, to own, to love, to understand and to have freedom. It wasn’t enough for me to be content with my own rambling thoughts so I asked a few people to read Paulo’s quote and share their own perspective. As always,when I ask…I receive back so much more and, once again, my eyes were opened to see the incredible insight and wisdom that others have. Her response came as I was walking around a farm that belonged to my family. I stood underneath a huge tree with a trunk so wide and thick that 3 people could wrap their arms around it and still just touch fingertips. 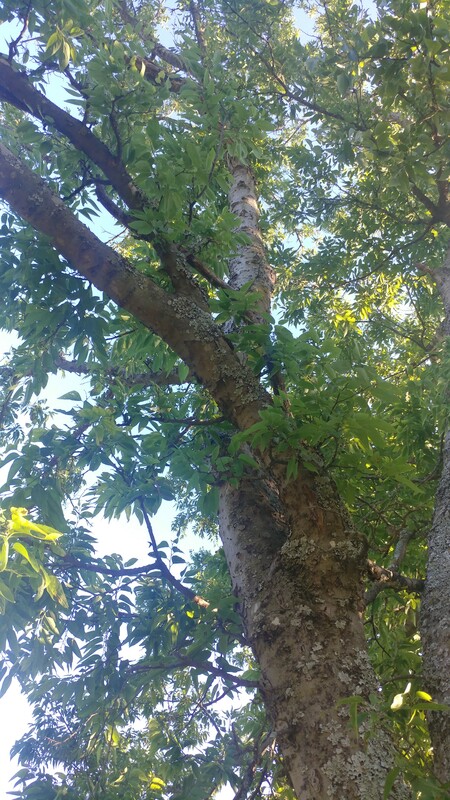 The branches reached high towards the heavens and offered such a breathtaking shade canopy…and as I read my friends words again and again, I couldn’t help but think that is such a profound way of looking at Paulo’s words. Every tree,like every person, is unique and some grow deep,strong roots and have a wide reach while others just never seem to grow and bloom. The trees in the forest and the farm were left alone- battered by the storms, warmed by the sun, soaked by the rain and they grew…much like people that let the experiences of life make them strong, gracious and beautiful. However, I’ve always noticed that trees planted to look perfectly coordinated with the landscape, constantly pruned and clipped never seem quite as beautiful, strong , graceful or “real” as the trees that grow wild and free. Those ornamental trees take so much time and effort to keep in their “proper” place and their growth is stunted because they are owned by people that want the trees to appear a certain way, be a certain size and shape and do a certain thing. Isn’t that like relationships? When someone tries to “own” another person- to control their growth,to prune their branches, to make them be “just so” then the relationship never really reaches high or grows deep, it doesn’t weather the storms well and it becomes so much less than it could be. Yet when a person and a tree has freedom, the strength and beauty that grows is absolutely breathtakingly beautiful. Which again made me think of trees and of birds.The huge variety of birds has always amazed me and I’ve read that every bird sounds different, too, with distinct songs and calls. I love seeing birds outside but whenever I see one in a cage, my heart just aches and yet I know that these types of birds are bred- pruned- for the purpose of looking pretty in their gilded cages, singing the only song they can, mimicking the words spoken to them. They have never experienced freedom and couldn’t survive if they were free to fly. They can only live if they are owned. Some people want and need relationships like this. Maybe their past has cast such a long shadow that it covers their present and future with the flickers of pain and the only way they can give and accept love is with certain conditions- cages that lock others out and them inside. They are so afraid of losing love, that they limit love and sometimes, they wind up losing the very thing they’ve tried so hard to hold tight. It’s a type of control that makes sure the person, like an ornamental tree, stays right where it’s supposed to and looks as good as possible to everyone that comes around. What if we took that perspective of his to heart? What if we loved deeply with gratitude that we have this moment, this opportunity, this person that chooses to love us back? What if we recognized love in all different forms..just as we see the beauty and purpose of all the trees in the woods and marvel at the numerous species of birds? What if we were grateful for the time we had instead of regretting the time we’ve lost or worrying about how much time we might have left? Just as I love this place where I’ve built my massage business and consider it “mine” in so many ways, the truth of the matter is that I didn’t plant a single tree that brings me such joy..I can only be grateful that someone else did many years ago. I have planted flowers that will return year after year- growing more abundantly each time. I’ve loved this place deeply but I do not own it and when I leave, it’ll still be a part of me; carved into my heart and I’ll yearn for the patio and the peacefulness it gives me each day. If we can just ponder Paulo and put things into perspective maybe we’ll experience love the way it’s intended to be and we’ll offer shade, shelter, protection, and purpose to all those that we come to know and to love. 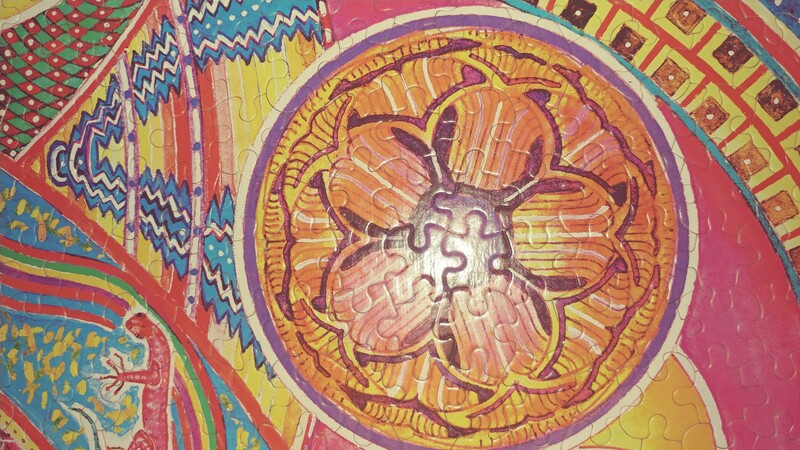 I placed a 550 piece puzzle on the coffee table at my massage studio and encouraged the clients that were waiting to put it together, to find the pieces and fit them into place, to search and seek and to use their mind and hands in a productive, creative way. 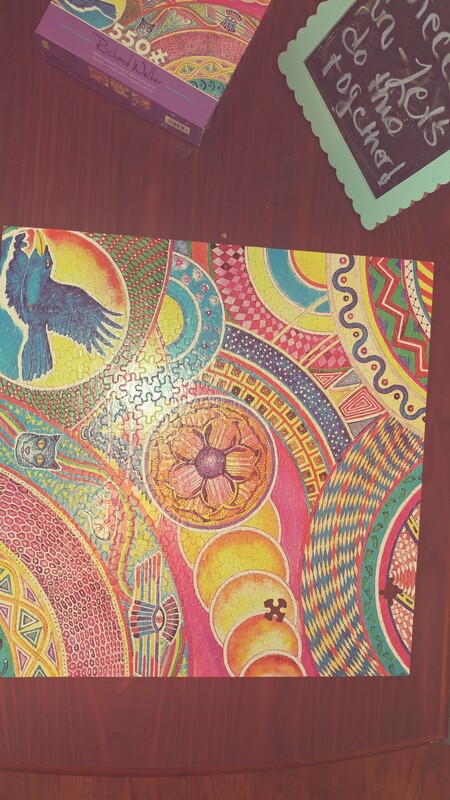 After a week, I came out of session to see the puzzle completed….as best as it could be. Four pieces of the puzzle were missing, so I got on my hands and knees and searched for the wayward pieces. I found two pieces which I quickly put where they belonged and then I swept under the furniture and looked underneath the cushions of the chairs and couch but the missing pieces were not to be found. My original plan had been to glue and frame the puzzle and use it for art on the walls of the studio, but the missing pieces made me change my plan. but then….it hit me right in my heart of hearts. Things don’t have to be complete to be beautiful. Life isn’t perfect and all the pieces don’t always fit in all nice and neat. Everything doesn’t always fall into place and yet….there is beauty in the brokenness, in the vintage treasures,in the imperfections and in the space. I don’t have to hear everything in order to understand the intention of what is said. I lip read and even at my best, there are still times I miss words and just fill in the blanks with my imagination…and sometimes that’s even better….or worse. I also use AVA, the Audio Visual Accessibility app, to help me catch what people say. Often my hearing friends stare at AVA and find flaws…they see the things AVA misunderstands,the parts that are muddled, the missing phases, the words that weren’t spoken…and they shake their heads and question the reliability and purpose of AVA. However, I see AVA with different eyes than they do and my perspective changes theirs. AVA gives me more than I have ever had, it gives me glimpses of conversations that I would have never caught, pieces of lyrics, words from people as they pass by, random bits and pieces that hearing people take for granted. AVA lets “overhear”..eavesdrop,if you will call it that…all the things I’ve never been able to understand. I hold AVA while at soccer games and finally have a clue to what the other parents are laughing about. I sit AVA on the counter as I check out at Kroger and read the flirtatious batter between the teenage cashier and the sacker. Of course I don’t get every single word but I get more than I’ve ever had before in my life. Another thing that came to mind as I looked at the puzzle with the missing pieces is relationships. So often we expect another person to completely fill every need and want we have.We expect our loved ones to read our minds and fulfill all our desires. Then if that doesn’t happen,we get disappointed, angry and hurt and throw up our hands and knock the puzzle to the floor, so to speak. If all the “pieces” of our relationship don’t fit, match up perfectly, or look as good as we think it should, then we tend to overlook all the other pieces that do. Isn’t that tragic? Instead of seeing the parts that are good. the focus centers on what isn’t. Instead of exclaiming over the beauty, the attention falls on the imperfections. It’s as if it’s an incomplete puzzle that must be broken apart and put back in the box, stuck in the shelf of a closet until maybe,just maybe the other pieces show up. I wonder,though, what it would be like if we overlooked the missing pieces and choose to see the big picture….to use our imagination to fill in the empty spaces with love and grace and a sense of humor…. 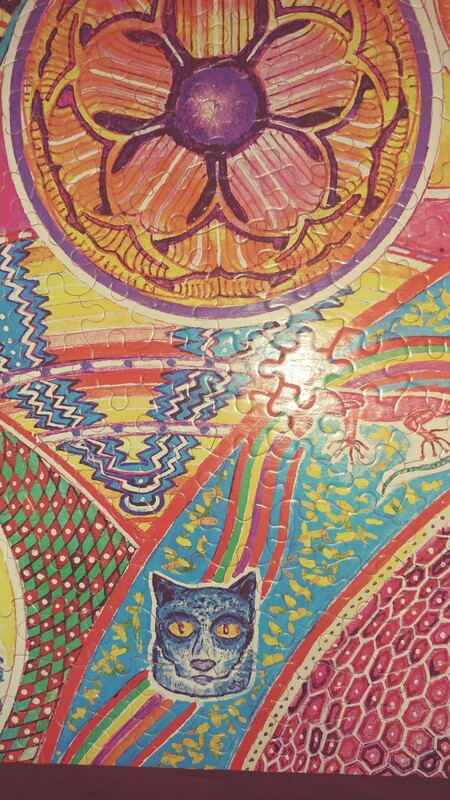 Like this puzzle I had at the studio…look closely and you’ll see the bird in flight, the cat, the intricate designs and brilliant colors….and if you focus on those, you’ll find that the missing pieces just seem to fade into the background and not make much difference at all. That’s how I choose to see life..as a gigantic puzzle with several pieces that just don’t fit and it’s all the more beautiful because of it and that’s how I see AVA…it’s another puzzle that is absolutely beautiful in my eyes. We are puzzles ourselves..incomplete,complicated,and beautifully designed….and we all have missing pieces….and that’s perfectly okay. Yesterday,my client was running just a few minutes late which gave me time to walk outside and look at the flowerbeds and the empty pots. I stood there in the front yard, and adjusted the single pot of pansies, and picked up the picture that had the saying, “Life is a journey..enjoy it.” engraved on it then I walked to the back patio and gazed at the yard and the bare trees and felt the familiar tinge in my heart- the call of nature, the urge to plant and be filled with the peace that comes to me every time I am doing what I love. Believe. Faith. Plant. Go Ahead. Tears sprung in my eyes. This is what I needed to hear, to feel– that deep, down assurance, that powerful boost of courage and conviction that didn’t always fit logic but that had always been my guide- God speaking to me.. and my intution kicking in. I decided right then and there that I would go to Lowe’s after my last session and buy a few flowers and check out the sectionals. During my gap between clients, I jumped in my car and drive over to Greg’s office to share what I had experienced with him and he just smiled at me and told me to go ahead and do what I felt I was told to do. My next stop was to Tuesday Morning where I went in with the intention to get a birthday gift, gift boxes and tissue paper but, like always, I rambled over to the garden section and then to the wall decor and there was another sign, waiting for me . “To plant a garden is to believe in tomorrow.” Simple black letters on a glass pane spoke further truth to my soul. I held those words in my hands for just a few seconds but they made their mark on my heart. I found some small garden stones inscribed with e words that I was searching for – a blue one with “love” and two white ones, one with “faith” and one with “believe” and I felt as if this was all coming together in ways that I had not expected. Saturday morning of March 3, I planted lantana and placed the stone with “BELIEVE” in the middle of the blooms and then I placed “FAITH” in a pot filled with red dianthus and I laid the stone of “LOVE” right by the front door where everyone that walks up will see it and maybe, just maybe they will feel it. It is mine… until it is not. It is until it is not. Maybe this is something that we all need to give some real consideration to. what we have is only ours until it is not…and during that time- no matter how brief or how long- we need to make the most of it. We aren’t guaranteed anything but yet we have enough faith to develop friendships, we have enough courage to start a business, enough love to pursue somone and we believe enough to plant flowers and create gardens. All these words, all these thoughts, all these choices and one thing I know for sure is that whatever happens, wherever I go, whatever I do, it is my chance, my choice,and only mine until it is not and I want to be known for love, for faith, for believing and for having the courage to listen to the whisper of God and go ahead, to chase my dreams and follow my intuition and to love who I am with and where I am, as long as I can. It is mine,after all, until it is not. I hear it all the time, ” You don’t look your age,” and I have always just smiled and took it for a compliment but yesterday I got to thinking .. and I realized something about what that meant. There ya go. That is it. Isn’t this something that stops us in our tracks .. keeps us from doing what we want … those words…. “what it looks like” holds us captive, doesn’t it? I know so good and well what those words do to people and to me. So I back off a few steps and I tuck my hands in my pockets or cross my arms, to hold back my natural tendency to touch as I speak and lay my hands on someone while I’m listening. After all, I get it, really, I do. We live in a culture that is so visual, so hooked so social norms, on fitting into perfect places and leaving nothing to chance, to be open to interpretation. It is so much easier when things look like we think they should… even when they aren’t. That is what it looks like, after all. But things are not always what they look like. That couple you see comparing wines at the grocery store may very well just be strangers sharing a few minutes of laughter and a common ground before parting ways to never cross paths again. But then again, they may be business associates planning The next event. The older lady sitting alone at the cafe lost in thought may have just lost her husband and that is why she didn’t respond like she usually does. She isn’t hard of hearing no matter what it looks like. She hears just fine, thank you very much, but she just wasn’t in the mood to chit-chat just yet. That exhausted man at the park with the talkative toddler isn’t a divorced dad putting in his mid-week visitation. He wishes it was that simple, but it’s not. The truth is, he’s been balancing his job, his daughter and a bed-ridden wife for several months now. But that isn’t what it looks like. Back to this all over again. If we are always so concernd about what it looks like instead of what we KNOW and what we feel then we are falling into that very same trap that holds so many back and afraid of stirring the proverbial pot. I wonder, though, if we stopped thinking so hard about what it looks like and instead just decided to take each situation, each encounter with an open mind and a heart that dares to see beyond what it looks like and to see what it really is and what it could be. Maybe, we would stand closer and touch more often. Maybe we would lean forward without second guessing what the people two tables over will think. Maybe we would strike up a conversation with that guy looking for wine without thinking that it will be inappropiate. Maybe we would hold hands.. maybe we would ask someone if they would like to have lunch or see if they would like to walk to the square for a drink. Maybe we would get up and dance. Maybe we would stop by and see an old friend again without wondering what it would look like to someone else. Maybe we would regret less and live more. There aren’t really any easy answers to this and I knew that before I started writing my heart out but I know this much for sure- things are not always what they look like and there is always so much more to know, to discover, to learn. But this is what it looks like. …..and, yes, I really am this age…this is what it looks like to be this age… when you are me, anyway!